The new Arsenal kit (awful), Jack back next week, Diaby eager to repay Wenger and Chamakh’s in the dog house. "Are your bags packed? The way out's this way"
Saturday morning greetings! Sorry about the absence of a post yesterday. It’s been a busy ol’ couple of days for yours truly. Fear not, I shall be back to normal posting now. Sounds to me like somebody’s going to be shown the exit during the summer. Given just how ineffective he’s become, it’s hardly the end of the world. Another player maligned in a similar manner is Abou Diaby. I’ve made no secret of my admiration for him as a player in the past; if it weren’t for all those niggly injuries that stemmed from a terrible challenge by a call centre moron, I truly belive his Arsenal career would be an entirelly different story. He has talent in abundance. If he could just get a full season under his belt, I believe he’d come good. “I just need to carry on and stay focused every day in my rehabilitation, I feel in a good way now. “Football itself has motivated me, because it’s the thing that I love. There is also my family and team-mates, manager, medical staff – they have all helped me. It was reported that Jack Wilshere would make an appearence for the reserves on Wednesday, but it didn’t happen. There was no rush to plunge him back into any sort of action, so the right descision was made. It’s rumoured he could feature at some point next week in another ‘behind closed doors’ match. Image from Le Grove (where I stole it... tee hee). That’s all from me today. With a tedious week out of the way, the excitement for the City game on Sunday is building nicely. Tomorrow, I’ll be bringing you a preview of that game. Until then, thanks for reading, you beautiful bastards. Nike the Goddess of Victory … well it seems not! Is the black to mourn our parting? I certainly hope so on this offering! I have never in ma life seen Arsenal putting on such a kind of jersey. BLACK????????????????????? ?, not good enough 4 the gunners. 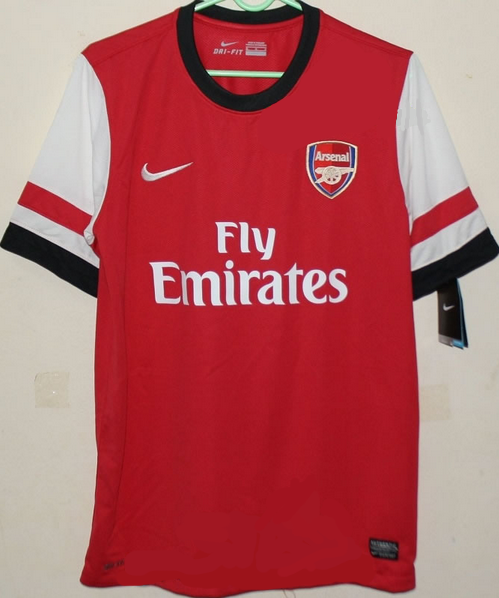 I have never and never again in ma life seen the Gunners putting on such a jersey, (BLACK) IS NOT A GOOD COLOR TO BE INCLUDED ON OUR NEW SHIRT.